A-apparently I can't draw people anymore but these objects look so nice, I can't complain. Maybe I should just draw props from now on. 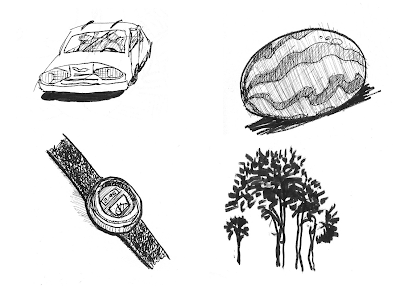 A car, a watermelon, a wristwatch, and a brush pen-ly tree... There's a double meaning in that! "Oven means many noodle faces."